You know very well – making good odds requires a lot of knowledge and this is obtained through experience and using the facts that are available to you. Experience and methodology are your strengths. 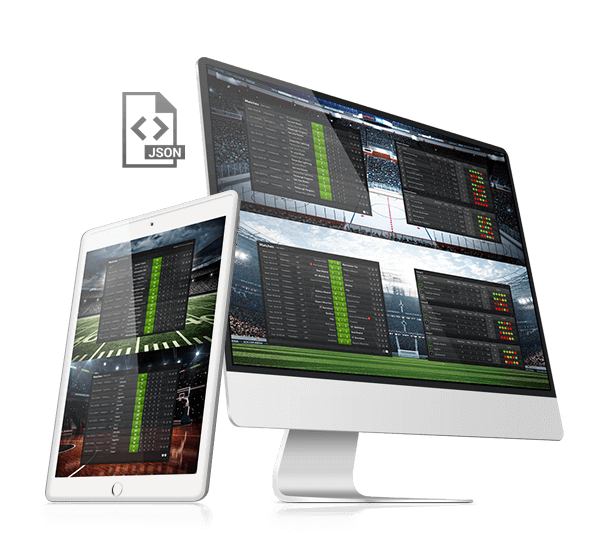 We can back you up with our vast offering of sports data and statistics, to make sure that when you use our SportsAPI feeds to create your own odds, you have access to a large, reliable, and user friendly database of raw data. The biggest fans of placing bets, tend to bet on more than one sport and definitely on more than one competition. To keep their attention and avoid losing them to other websites when they're looking for data to make better evaluations and betting choices, you need to have the best coverage available on hand. So here we are with our impressive coverage of more than 1,000,000 athletes, 27,000 teams and nearly 6,000 competitions. All with unified data and 24/07/365 support available on request. WHEN IT IS LIVE! MAKE IT ALIVE! Live betting has been on a dynamic rise for many years now. Many users looking to place bets are seeking the additional thrill of betting live during the game and they are willing to bet big. All they need to have is a fast, clear and reliable source of data on your website. Let us help you when it comes to this challenge by providing the vast LIVE coverage that's contained within SportsAPI, partnered with a great database of historical data. What an inspiring combination! When it comes to the needs of sport fans, the wide offer of livescores and historical data is mentioned so often that it's become the holly grail of the sports media industry. The platform that has the widest, deepest and fastest data, is the one who will most likely end up winning the attention of fans. Let us help you in becoming a winner, as winning is something we know a lot about. More than 1,000,000 athletes, nearly 6,000 competitions, 27,000 teams and up to 30,000 events per month. Whoa! This is a great offer for your website projects to include. All served with a clear and unified data structure available for both, PUSH and PULL delivery systems and offered in our JSON and XML feeds. If you build your own statistical engine, you have a lot to think about and plan on your side. We respect and understand this, because we have been part of this industry since 2006. We understand your needs, challenges and the time frames involved more than anyone. This is why we made sure that SportsAPI has been designed in a way that enables intuitive and quick integration. It won’t take a up a lot of your valuable time. Our detailed documentation and experienced consultants will help, whenever you have a question. Life can be fun and easy – so can business. Why not let us help you. One of the biggest challenges for the sports media is to achieve a balanced level of attention from users. Most cope with a reality, where live events create more traffic, but the silent times between them, result in a large drop in the number of fans visiting websites. This affects your business and limits your incomes from sponsors. This is why we made sure to build for you a solution that helps you to create interest on both match days and the days in between. The live data from SportsAPI can be displayed while the events are taking place to impress the fans with its pace, while the large database of historical statistics gives them endless content to browse during the rest of the week. It's a win-win situation!